From Baltimore in January to Portland in August, the industry offers a plethora of trade shows and educational events designed to help grow your business. Some are strictly buying shows, while others offer education and networking opportunities. No matter how you slice it though, it’s tough (and costly) to attend them all — so the decision boils down to where you will garner the most value. Increasingly growing in size and value, the Farwest Show is the only show in the West where you can find an industry-wide trade show, top-notch education, the latest new plant and product displays, nursery tours, networking and more. Let’s just say Farwest is the full-meal deal, so read on for a glimpse at the “meat and potatoes” you’ll find at Farwest, along with the gravy AND the pie! 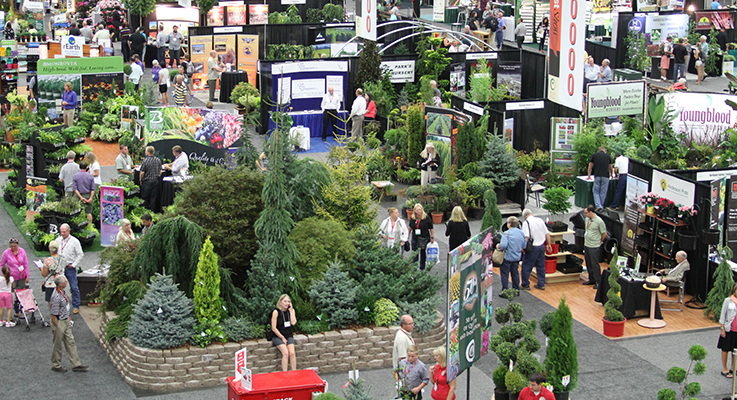 Not only is Farwest the biggest show in the West, but it is also known for its fabulous offering of green goods, with nearly 50 percent of exhibitors being recognized as some of the finest growers in the country — or “Nursery Country” as we like to call it here. If you are looking to fill your garden center or landscape projects with the best plant material around, or enhance your growing operations with quality starts, Farwest is the place for green materials that can’t be beat. Whether you are a wholesaler or a retailer, Farwest also boasts a large array of suppliers and services ready to help you grow your business. You’ll find everything you need from soil inputs, machinery, plastic products, technology, hard goods and more all in one convenient location. Although the show wouldn’t be of the magnitude it is without the hundreds of exhibitors and thousands of attendees, Farwest also wouldn’t be deemed one of the top trade shows in the country if it weren’t for the stellar educational program that receives high remarks year after year. Each August the show draws some of the most talented and respected speakers from across the country to share their insights and knowledge with Farwest attendees. This year attendees can take part in over 80 seminars, including 40 free mini-sessions. Whether you are looking for retail insights, pesticide credits or sessions geared towards developing your business you’ll find something well worth your time and investment at the 2016 show. A trade show wouldn’t be a trade show without one of the number one reasons folks state they attend: the networking! At Farwest you won’t find a lack of networking opportunities. From the “Emergent” gathering geared towards young professionals in the industry to “Women in Horticulture” you’ll find plenty of business oriented opportunities as well as social ones, like the fifth annual Pub Crawl. You never know who you might meet at Farwest, and you never know how that connection might help you both grow professionally and personally down the road so take advantage of these opportunities and expand your network — you won’t regret it! Above and beyond the expo floor, seminars and networking are how people learn about the key trends driving the industry. Farwest has long been viewed as a show that highlights the latest trends and is always on the forefront of what’s next. From adjusting show hours to better fit exhibitors and attendees’ schedules, to keeping up with technology and creating a useful app that helps organize and plan your Farwest experience, to highlighting industry shifts and movements in plants and products through features and displays. You’ll leave the show with new insight on the latest industry trends and how you can apply them to your business. One of the most exciting new offerings at Farwest debuted last year with the “Solution Center for Growers.” This new feature offers free mini-seminars that anyone with access to the show floor can take advantage of. Not only is the Solution Center back this year, but the “Idea Center for Retailers” has been revamped to follow that proven format and is sure to offer timely information. Sessions are geared to be less than 30 minutes — long enough to give attendees some good information, but short enough to keep you moving on the show floor so you don’t miss out on the expo itself. Perhaps one of the coolest things attendees can experience at the Farwest Show is the vast array of features highlighting the latest in new plants, new products, and grower and retailer trends. This year’s New Varieties Showcase boasts nearly 60 brand new, super exciting plants about to hit the market. All selections will be available from Farwest exhibitors who are happy to take pre-orders, ensuring you have these new selections when marketing starts hitting consumers. In the New Products Showcase you’ll find the hottest new products, hard goods and technology about to hit market geared towards growing innovation in your company and addressing growing customer needs and requests. Last, but not least, be sure to stop by the Grower’s Showcase and catch the latest industry buzz as this year’s theme is “Plants with a Purpose: Pollinators.” Whether you are a grower, retailer or even a supplier, pollinator-friendly plants and gardens are one of the highest concerns amongst consumers right now. Be sure to stop by and get inspired and educated on how your business can play their role in helping shape the future of our industry. What good meal (I mean trade show!) wouldn’t be capped off without a nice slice of pie, or in this case a visit out to Nursery Country. You left room, right? Of course you came for Farwest — the expo, the seminars, the networking and to explore the latest trends — but you won’t want to leave without taking some time to visit Oregon’s renowned Nursery Country. Come a day early and catch the official Farwest Show Nursery Country Tours, or stay a day late and design your own tour. Show organizers created three fabulous tours — two headed out to some of Oregon’s finest wholesalers and one headed to a hearty variety of Oregon’s amazing retail garden centers — and all three are can’t-miss. Be sure to register early so you don’t miss out. Space is limited and the tours do sell out. If you like the idea of being your own navigator, visit www.nurseryguide.com to peruse the wholesale nursery map and plan your own adventure. Whether you are headed west by plane, train, car or bus, no matter what you are seeking to get out of your experience at the 2016 Farwest Show, it is all there for the taking. So grab your business cards — and your adjustable waistband pants — and hit the road this summer for an adventure in Portland, Oregon, you soon won’t forget.